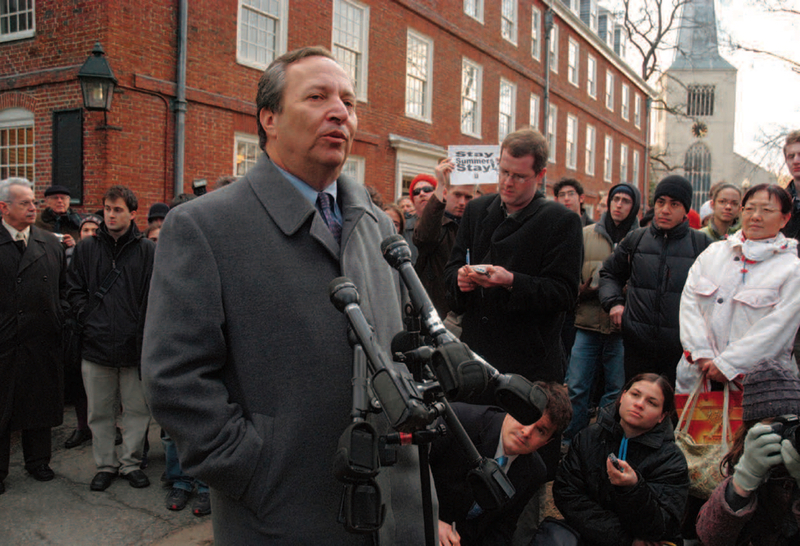 After a telephone news conference to discuss his resignation on February 21, President Lawrence H. Summers stepped outside Massachusetts Hall to face the broadcast media and meet with student supporters. After five years of frequent controversy on matters of fundamental academic and intellectual substance, and the style in which those issues were pursued, the Harvard presidency of Lawrence H. Summers will end on June 30. Throughout his administration, questions about how the University should develop faculty, teach students, and organize research in the twenty-first century were constantly raised but incompletely explored. Given his unexpectedly brief tenure, that leaves much work for Harvard’s transition leadership, and for Summers’s ultimate successor. Those leaders must also help calm the community and refocus its energies on its academic missionpriorities that seemed particularly pressing in the fervid atmosphere immediately following Summers’s resignation. • Summers would serve through the end of the academic year. Following a sabbatical, he planned to return to the faculty, and the Corporation intended to appoint him to a University Professorship, Harvard’s highest professorial rank, upon the completion of his presidential service. • The Corporation would have “more to say soon about the search for a new president, which we intend to launch promptly” (see "Precedent-Setting Presidential Search"). Saying that it had accepted Summers’s resignation with regret, the Corporation cited his service to Harvard, animated by “a sense of bold aspiration and initiative, a prodigious intelligence, and an insistent devotion to maximizing Harvard’s contributions to the realm of ideas and to the larger world.” As examples of “invigorated” academic programs and keener engagement with “complex challenges facing society,” the Corporation cited work on the undergraduate curriculum; Harvard’s international agenda; the “pursuit of new intellectual frontiers” within and across departments and schools; enhanced financial aid for students from lower-income families and graduate students pursuing public-service careers; faculty appointments; and planning for Allston development, particularly in the sciences. The past year, the Corporation noted, “has been a difficult and sometimes wrenching one.” It exhorted members of the community to “look forward in a spirit of common enterprise” of scholarship and education. In his own letter, Summers cited “rifts between me and segments of the Arts and Sciences faculty” as the factor making it “infeasible for me to advance the agenda of renewal that I see as crucial to Harvard’s future.” That definition of what had transpired would become sharply contested ground. Nonetheless, he said, his decision to step down had been prompted by “the extent of the rancor that had emerged” and the extent to which he personally “had become a large issue” within FAS. He had thus “very reluctantly” concluded that it was best to step down. He felt he had “worked very hard over the last year to build bridges to meet members of the faculty part way” on issues of concern and of control, but it had become clear that for a substantial segment of that faculty, the gap could not be closed. Was there a risk, a reporter asked, that in ceding the office, Summers would allow a “small vocal group” within a faculty to “take down” Harvard’s president, threatening to make the University ungovernable? “As I assessed the situation, I very much had the concern that you referred to,” Summers said, but he concluded that making way for new leadership was in Harvard’s best interest, and his own. Reflecting on the “marvelous variety” of the University’s research and teaching, he said it had been “my approach and my conviction that all of that could best be harnessed, be enhanced, by seeking to do more, to do it in bolder ways that had more impact.” It was to that end that he had sought to be challenging: for many members of the community, that had “very positive results,” but for others, “it was threatening.” In retrospect, he said, he might have more successfully advanced the University’s interests by showing more reverence for its traditions. As he noted in his letter, he would have “preferred to stay longer,” to complete more of his vision for twenty-first-century Harvard. He then left Massachusetts Hall for a rally outside with student supporters, and a photo op for the evening news broadcasts, the next morning’s newspapers, and the University website. How, then, did Summers’s resignation come about, making his the briefest Harvard presidency since Cornelius Conway Felton (1860-62) died in office? (Poignantly, in the current context, Samuel Eliot Morison’s Three Centuries of Harvard quotes Felton as confiding to a colleague that “there is no more comparison between the pleasure of being professor and president in this college than there is between heaven and hell.”) Was this vigorous president, a skilled student of power, suddenly overwhelmed by “segments” of one faculty? And why did matters come to a head at this moment? Though many of the details and discussions remain private, the president’s own comments, referring to developments during the prior two weeks, suggest some of what unfolded. The January 27 leak, deliberate or inadvertent, of Dean Kirby’s resignationbefore he could discuss his departure with his senior staff and release the news on February 1, as he plannedand the characterization of that departure by anonymous sources as Kirby’s firing by Summers, was obviously personally wounding to Kirby. With Summers at the World Economic Forum in Davos, Switzerland, into that weekend, while the College was still on its intersession break, the news and the manner of its dissemination struck many FAS professors as signs of deep-seated differences between the president and their faculty, and emblematic of persistent leaks, innuendoes, and management by indirection emanating from Massachusetts Hall. Far from passing with the day’s headlines, Kirby’s announced departure heightened the broader concerns. As the new term began, both Summers and faculty members realized that the atmosphere had been altered. At the February 7 FAS faculty meeting, 300th Anniversary University Professor Laurel Thatcher Ulrich, speaking for its Faculty Council, outlined a plan, negotiated with Summers in a series of meetings, for unprecedented faculty involvement in the search for Kirby’s successor. (Summers had never gone beyond convening an informal advisory group for decanal searches.) Having already dealt with the Faculty Council (FAS’s elected representatives) and having apparently responded to the intense faculty concern about the situation by agreeing to this concession, the president may have felt that a plan was in place to proceed with pending business. But the meeting headed in a sharply different direction. Fifteen speakers rose to challenge Summers’s truthfulness; to object to the manner in which Kirby had been treated; to question Harvard’s moral position in the wake of the federal litigation against the University and Summers’s friend Andrei Shleifer, Jones professor of economics (see “HIID Dénouement,” March-April, page 67); to ask whether fundraising could be conducted in the prevailing circumstances; to express doubt that a dean could legitimately be appointed; to propose, somehow, a direct decanal appointment endorsed by the Corporation, bypassing the president; and, most ominously, to raise the specter of a second vote of no confidence in the administration. No one spoke on Summers’s behalf. Given colleagues’ evident dissatisfaction, the Faculty Council found itself unable to advance the proposed faculty-driven search committeeor any action. On February 15, it issued a statement: “On balance…we believe that a plan resembling the one put forth at the February 7 meeting, giving a strong role to the Faculty in the process, would be the most appropriate. However, a significant number of faculty have expressed doubt that any search at this time could succeed because they lack sufficient confidence that it would result in a dean who could enjoy the support of both the President and the FAS. As a result, we believe that this issue must be resolved before the search for the next FAS Dean can begin.” The subtext was that nothing could, or should, happen with the president in place. As Summers conferred with counselors, Corporation members, and othersand Corporation members undertook information-gathering efforts and conversationsdeadlines for a resolution loomed. By February 13, when the preliminary agenda was set for the February 28 FAS meeting, Weary professor of German and comparative literature Judith L. Ryan had moved ahead with her proposal for a new no-confidence motion. Another proposed motion called on the Corporation to collaborate with the faculty and to inject itself more directly and forcefully in current questions of governance and management. The meeting was scheduled for Sanders Theatre, to accommodate the expected crowd. The agenda would become final on February 21, following the Monday holiday. By then, Summers or the Corporationor bothhad decided that a change must take place. The Corporation was not likely to welcome a faculty motion advising on its conduct. Given his self-described “searing” experience a year earlier, Summers was unlikely to relish a protracted, even more heated extension of the February 7 exchanges at the next faculty meeting. Derek Bok, who on February 13 had announced publicly his intention to step down as chair of Common Cause’s national governing board, received a formal request about the succession from Corporation members James Houghton and Nannerl Keohane early in the Presidents’ Day weekend. Was the premature end of this administration caused by a faction of one faculty exercising undue power, or generating unwarranted resistance to needed change? It would be presumptuous to try to aggregate the opinions of hundreds of individual faculty members, or to guess at Corporation members’ private thoughts, and it is far too soon to attempt a history. But it seems clear that these events were about far more than a dean’s departure, or differing opinions (academic or political) held by a few professors opposed to the president. Similarly, the harsh confrontations in early 2005 were sparked by sharply divergent views about Summers’s controversial remarks on the role of women in science and engineeringbut that was hardly the sole factor, nor perhaps even the most important. Then, as reported (see “At Odds,” May-June 2005, page 55), faculty members from a variety of disciplines spoke about their sense that the president, in pursuing change, had claimed “sole agency” to do so, soliciting and then ignoring informed counsel, resorting to “bullying and personal aspersions,” humiliating faculty members, and even silencing their opinions. All this suggested classic management problems, albeit in a university context (see “The Way Forward”). Summers at the time responded along those lines: acknowledging the criticisms and promising to adapt his style, to rethink the “roles of the central administration and deans” on curriculum (“very much the responsibility of the faculty”), to consult on matters like Allston planning that are “inherently University-wide in their significance,” and to create “more transparent” academic planning centrally and in the schools. Over time, he hoped, those steps would yield “both continued momentum and a necessary rebuilding of trust.” He began the academic year with a new chief of staff, his third, and a new personal press spokesman. He tempered his visible involvement in faculty policymaking. But in other respects, the decisions he had made earlier were not revisited, and remained flashpoints for diverse members of the University community who were involved in thinking about how to shape the institution’s future. To cite one high-profile example, work on Allston proceeded on its former course, with the appointment in January of a chief operating officer and a separate organization reporting directly to Summers (see “Brevia”). The announcement on February 17 of a site and architect for a first building complex, comprising some 500,000 square feet of laboratory space, made tangible Summers’s vision of a third locus for scientific research. Those decisions put Allston development on a fast trackbut without any evident process for the academic and administrative management of the research to be done there, or for coordinating that work with the rest of the University. Meanwhile, FAS is building extremely expensive and as yet unfilled labs (see “Fraught Finances,” March-April, page 61), and Harvard Medical School has unused space (now leased out) in its New Research Building. Will these facilities end up competing with the new Allston space? Although the central administration had conducted a planning process for interdisciplinary research that might locate in Allston (see “Scientific Ambitions,” July-August 2005, page 58), a University-wide review of the future of science at Harvardembracing FAS and the medical and public-health schools, and examining appointments, academic administration, and morebegan only this year, and will not even report until this summer. Because the central administration has been collecting since the beginning of the decade a “strategic infrastructure fund” assessed on all the schools’ endowmentsnow yielding more than $100 million annuallyit is better able to finance such new ventures than some of the schools themselves. That poses important questions for the faculties whose professors will work in any new locationquestions ranging from budgeting and teaching responsibilities to possibly recasting departmental and school boundaries and authorities. Though such issues may seem internal, they reach deep into the disciplinary organization of the modern research university. In this sense, one person’s perception of “complacency” or “resistance” is another’s vision of how academic talent has been developed, contact with students encouraged, and new knowledge evolved. Such differences can be resolved, but not with a snap of the fingers. Similar questions arose earlier in Summers’s tenure as the administration floated ideas such as moving all science, or all life science, to Allston (at the risk of segregating the liberal arts and sciences from one another, or the life scientists from collaborating chemists and physicists); delaying or canceling FAS science projects that were well advanced toward construction (perhaps stalling faculty recruitment in critical fields); building new Houses to expand the College student body (even as FAS sought to achieve a more favorable faculty-student ratio); or scaling back investments in the humanities, art museums, and other fields deemed of lesser prioritya barrage of big-picture suggestions that made professors wary. Those two schools, and others whose graduates pursue public service, also looked forward urgently to the fruits of a Harvard-wide capital campaign. Summers effected important measures to centralize fundraising, in part on the promise to increase donors’ gifts beyond their “home” schools in support of the less-well-endowed faculties. Nor is the financial pressure confined to those schools: as it has built facilities and ramped up new fields like systems biology, the medical school has had to tighten its belt, and as noted above even FAS, with its $11.7-billion endowment, is laboring under significant financial strain. Having expanded their faculties, facilities, and aid commitments, many parts of Harvard were already forced to rethink their budgets as plans for a fund drive were delayed last year. That concern factored into the atmosphere generally (and has only been heightened by the realization that the transition to a new presidency pushes a capital campaign far later into the decade). Where does Harvard head now? The current anxieties extend throughout much of the University, and form part of the very large agenda for Derek Bok, the interim president, who must reach out to reassure faculty, students, and alumni worldwide. The transition begins, moreover, with significant staff vacancies. In his February news conference, Summers said he hoped to complete searches for new deans for Harvard Business School and the education school. The FAS deanship, he indicated, would land on the interim president’s to-do list (Bok has taken it up). FAS’s search for a successor dean of engineering and applied sciences, a key growth area, may not be easily concluded in the current unsettled circumstances. The vice president for finance, Harvard’s chief financial officer, departed at the end of March. Further turnover in the central administration and FAS dean’s staffs may occur. Harvard Management Company’s new leadership, on whose investment results every school heavily depends, is just settling in (see “El-Erian for the Endowment,” January-February, page 54). After a breathtaking and bruising five years, the University appears stimulated by visions for the Harvard of the twenty-first centuryand eager for a leader who can enlist more members of the community in refining those visions and making them a reality. In the meantime, a battle-weary community seems to want an uneventful conclusion to the decanal and presidential terms of William Kirby and Lawrence Summers.